Holiday House has returned to New York City, and the 2018 rendition has transformed a townhouse on the Upper East Side. Located at 118 East 76th Street, this year’s Holiday House features the work of more than 20 interior designers including Interior Market Group, Melanie Roy, Timothy Brown Studio, and The Studio at One King’s Lane to name a few. Holiday House was started in 2008 by interior designer and breast cancer survivor Iris Dankner. Holiday House has been raising money for the Breast Cancer Research Foundation for over a decade, allowing visitors to get inspiration from top interior designers and experiencing products first-hand from leading brands. The project has expanded to The Hamptons, and even globally with Holiday House London. We are happy to see the return to NYC, and we went inside. Talk about serious inspiration! After 15 years in the television industry, Melanie Roy pivoted and began her career in interior design. She focusing on designing family-friendly residences. This is simply a glimpse into the inside of the 2018 Holiday House. We highly encourage you pay a visit, and take in the myriad rooms and inspiration sources. The house is open to visitors through December 2nd, 2018. All ticket proceeds benefit the Breast Cancer Research Foundation. Tickets can be purchased online. The 2018 Hamptons Designer Showhouse is underway, and we got an exclusive first look inside during the opening night Gala at the Bridgehampton home. Each year, the Showhouse allows designers to exhibit the latest in design trends all while benefiting the Stony Brook Southampton Hospital. This year’s home is presented by Traditional Home and was built by Barsalin Building and Design. The home is located just past Channing Daughters Winery and nearby to Bridgehampton and Sag Harbor Villages. The 8,000 square foot home is finished on 3 levels and comprised of 7 beds and 7.5 baths. The home is situated on 2 acres with a gunite pool and tennis on the exterior. The design features signature Barsalin touches. From the moment you enter, you are greeted with magnificent scale thanks to the double-height foyer that extends fully to the Great Room where a 25’ wall of glass overlooks the backyard and pool. An Open floorplan is at the core of the home’s design with a grand kitchen that flows to a 3-sided glass breakfast room, to a Butler’s Pantry/Bar, as well as an oversized outdoor Dining Porch. The home features beautiful materials throughout such as gray rift oak cabinetry in the kitchen and the most up-to-date electronic plumbing systems from Kohler in the Master Baths. The Showhouse designers have used this extraordinary canvas to exhibit the latest interior design trends from modern to nautical. We’ve highlighted some of our favorite spaces throughout the home, but with so must to see and all the inspiration that can be found, we highly recommend a visit to the house! Design by Lisa Friedman Design who specializes in high-end residential interiors. She has transformed the space into a serene setting for any Hamptons Dining party with a neutral palette of greys. 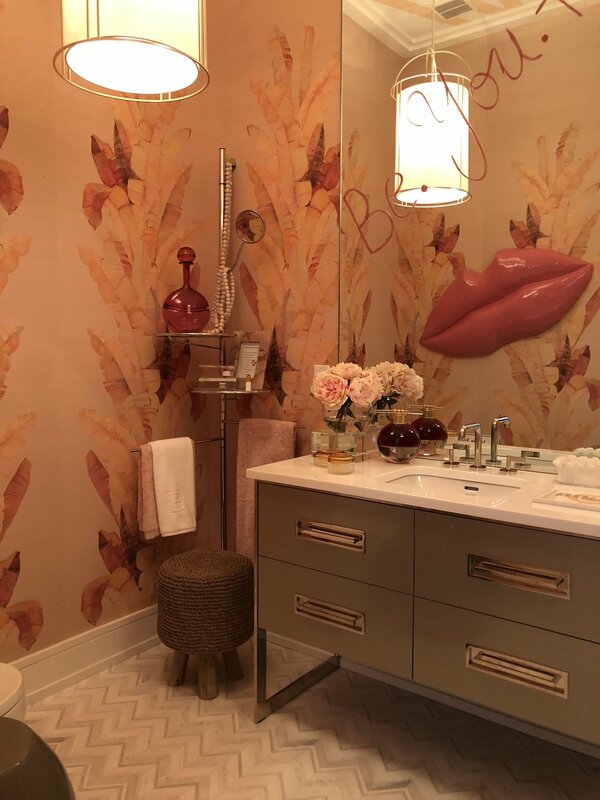 Jackie Young, lead designer and project manager for the last seven years, brings great energy and curiosity to her designs which is evident in the stunning powder room which features bright color and whimsical touches such as the lip art installation. Author, designer, and entertaining expert Mark Addison designed the Butler’s Pantry with inspiration from his book Cocktail Chameleon. We think he succeeded! 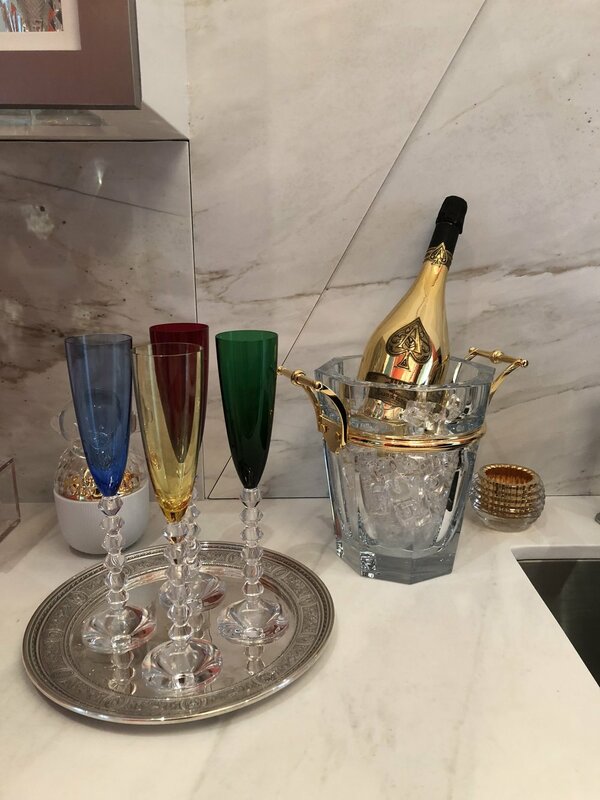 The space is a lively area to get any party started with is bright colors and luxurious details including Baccarat Glassware and luxe libations from Armand de Brignac and Louis XII. Need cocktail inspiration? Check out the art installation for some ideas! 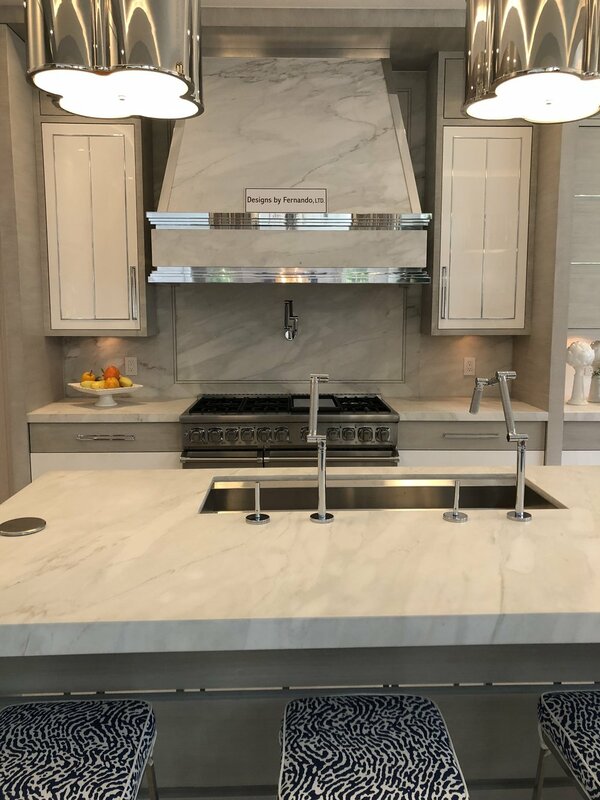 The kitchen of this year’s showhouse is really a stunner, and is at the center of the first floor given its flow into many of the living areas of the home. Designs by Fernando prides themselves on the use of custom finishes including stains, cerused textures, white washing, bleaching, and high-gloss finishes to name a few. Their trademark design is evident in this beautiful kitchen with a prominence of white and unique finishes such as carbon fiber faucets. The home offers a second, junior master, on the first floor where no attention to detail was spared. Shay Geyer has designed this space to be inviting with Hamptons touches like the color palette of blues and whites. The bath has a deep soaking tub, designer tiles, and a state-of-the-art electronic shower system from Kohler. The 46th annual Decorator Show House is underway, showcasing work from top interior designers. The Upper East Side townhouse at 110 East 76th Street has been completely transformed, and all for a good cause, namely the Kips Bay Boys & Girls Club. All proceeds from the events will go to the Kips Bay Boys & Girls Club which provides after school enrichment programs to more than 10,000 youth in the Bronx. The Upper East Side is known for its historic and grandiose townhomes, and the Lenox Hill neighborhood, the site of this year’s show house, is no exception. The row of townhomes at 110-120 East 76th Street was originally built by Augustus Hatfield in 1883-85 and are unique in that they are 36’ feet, must larger than the standard townhouse width in New York. This year’s show house, at 110 East 76th Street, has been completely reworked by Robert Couturier. Renovations on the home began in 2010. Couturier is most known for his work for billionaire financier, Sir James Goldsmith which jumpstarted his career. His vision for this year’s show house took inspiration from past projects he completed around the globe with an emphasis on the fact that the spaces in the house are meant to live in and move about, they are not simply “stages.” The expansive townhome provided the perfect backdrop for top interior designers to showcase their work. 110 East 76th Street spans 15,000 square feet across 7 floors. Part of the renovations included incorporating modern luxuries such as an elevator, which is accessible from each of the 7 floors. The home includes 8 bedrooms and 10 baths. It is a unique opportunity to own a wide townhouse on the Upper East Side. The Master Suit of the home alone spans 1,500 square feet and includes a separate sitting room, fireplace, and double baths. It is currently offered at $51,000,000. 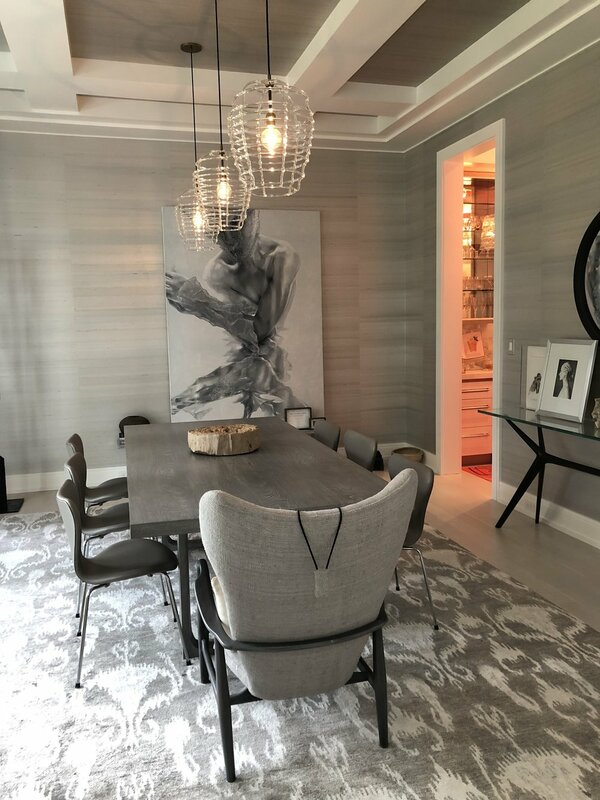 The expansive townhouse residence has become a showcase of work from renowned interior designers that have donated their time and skill to create the beautiful spaces. The interior features 7 floors of living space which have been transformed into sumptuous space from a attention grabbing, statement staircase to an elegant sitting room and Clive Christian kitchen. The interior designers have spared no attention to detail throughout the home, sourcing their decor from the likes of Hermes, Sotheby's, Bergdorf Goodman, and Roche Bobois to name a few. The Show House will be running Until May 31st 2018. Tickets can purchased online in advance by visting Kips Bay Decorator Show House. Remember, all ticket proceeds benefit the Kips Bay Boys & Girls Club. Just as we change out our wardrobes with the season, so, too, do we change out our home decor. Home fragrance is a key component of decor, and scents make the home more inviting. If you have your home staged to sell, take this time to look at the decor the stager has in your home- does it match the season? Details are important when it comes to staging and selling a home, and scent has a big impact on memory. What candles are you burning at open houses on a chilly fall Sunday? Switch out your candles to warm, inviting, rich scents that match the season and make your property memorable! The Victoria Shtainer Team recently previewed two of the hottest new developments in downtown Manhattan. Downtown (SoHo and TriBeCa) have always been desirable areas, however, the desirability is spreading even lower to areas such as lower TriBeCa and Financial District. Now, all of Downtown is the place to be with the hottest restaurants, shops, and destinations arriving to this locale, and many dubbing it "The New Downtown." We previewed the residences at the new Beekman Hotel and the West Village project, The Shephard. Both projects have beautiful model units open, and both were burning the best in fall home fragrance from Ambre by Diptyque to Ambre Japonais by Byredo. These units inspired us and reminded us how much scent can transform the home! The private residences at The Beekman are attached to the newly opened Beekman Hotel which is operated by Thompson Hotels. The Beekman is steeped in history, with its famous Temple Court 9-story atrium that dates back to 1890. The hotel is in the original structure along with the restaurant and bar, and the residences are in a brand new, glass tower directly adjacent to the original structure. Residences at The Beekman offer hotel-style living similar to other new developments such as 30 Park Place. With that being said, living in a building such as this offers a full suite of amenities, including in-room dining. The Beekman offers one, two, three bedroom and Penthouse residences starting 170 feet in the sky. The views from the apartments are spectacular. The floor-to-ceiling windows allow residents to take in sweeping views of the rivers, downtown skyline, and midtown on north facing units. Interiors are designed by Thomas Juul-Hansen with finishes including Madreperola Quartzite Stone countertops, Miele appliances, and marble flooring in the bathrooms. Living in a hotel certainly has its perks. Residents at The Beekman will enjoy their own private entrance and lobby and have access to the integrated luxury hotel amenities, preferred rates at Thompson Hotels worldwide, in-room dining from hotel restaurant Fowler & Wells run by Tom Colicchio and Keith McNally, as well as access to à la carte housekeeping services. Other amenities include a fitness center with access to personal training, roof terrace, and a media room. The location, at the heart of downtown is convenient to downtown neighborhoods, and all the new arrivals such as The Oculus. Current availability starting at $1.5M for a 1 Bed, 1 Bath up to a 3 Bed, 2.5 Bath offered at $4.15M. Contact Us for exact availability and pricing. Situated in the quaint West Village, the Shepard feels like it has been a long-time neighborhood resident, utilizing the original facade of the building and welcoming guests with its carriage house lobby. The residences have a coziness about them with vaulted ceilings and unique arched windows. The residences feature warm and rich finishes that blend both modern and old-world styles including brass hardware and custom Gachot solid wood floors. Kitchens feature brass and satin nickel finishes with a full Miele appliance package. Bathrooms are luxurious with heated floors by Lefroy Brooks and custom Mahogany vanities. The Shephard will offer residents a full amenities package which includes a private garden, library curated by Assouline, spa, wood-paneled gym, and recreation room. Currently, The Shephard has residences available starting with a 3 Bed, 3.5 Bath Maisionette offered at $6.9675M all the way up to unique penthouses starting at $24.5M. If you are interested in becoming a part of this special West Village project, contact us. The season's most popular scents are based in natural elements and materials- think woods, leathers, and spices. Below are 8 candles with fall scents to make your home smell wonderful. You know what we will be burning this season! Staging a home is certainly an investment, but it is an investment that has driven results for sellers all across the country. Many home sellers are hesitant to stage their home because they think it is too costly, too much effort, and won’t yield results. Get all these reasons out of your head because staging your home is an extremely effective tool that can reduce your home’s time on the market and increase its value, both of which are money in your pocket. Additionally, in a highly competitive real estate market, staging can be a tool that gives your home a competitive edge. So, you are probably wondering, why should I stage my home? A sound marketing strategy is necessary for any listing, from social media campaigns to open houses, and yes, staging, marketing is a key component of selling a home. Staging is, in fact, a form of marketing and an effective one at that as it allows the buyer to mentally move in to your home and visualize the space. Imagine a buyer that has tirelessly been looking at properties, perhaps empty apartment after empty apartment. In the mind of the buyer, they all start looking the same and nothing notable can quickly be recalled from memory. In this instance, staging would make your home “stand out from the crowd” and be more memorable to prospective buyers. A staged home looks appealing and inviting, and also allows the buyer to more easily see his or herself in the space. All of these aspects help to evoke a sense of desire in prospective buyers. As a result, a buyer is more willing to pay a premium for something he or she deems as desirable and valuable to him or her. In fact, the National Association of Realtors conducted research that reported that for 32% of buyers the value the buyer was willing to offer for a staged home was 1-5% higher than an unstaged home, and even went as high as a 10% premium! The Real Estate Staging Association reports that homes staged prior to listing spend on average 76% less time on the market. Their research concluded that staging did, in fact, work to reduce time spent on market. Less time on the market means savings for you. Many sellers forget that the longer their home sits on the market, the longer they are responsible for mortgage payments, maintenance costs, etc. which all add up and can sometimes be more than the cost of staging! The old saying you have been hearing since childhood comes into play with staging and selling your home as well. Today, the majority of buyers start their home search online, and the power of images has never been more important. Staging will make your home stand out in online searches, increasing the chances of attracting prospective buyers right out of the gate. If you do not stage your home properly from the beginning you risk making a bad first impression and face the costs of lost time. 20 West 64th Street, Unit 28DE represented by The Victoria Shtainer Team exemplifies effective staging. The apartment, an expansive 3,045 square foot home by Lincoln Center, offers ample space and stunning views. Living in this home offers a true lifestyle, being located right in the heart of Lincoln Center with some of the best the city has to offer at your finger tips. Without staging, the apartment feels very expansive and it is hard for prospective buyers to actually visualize waking up in the master with Central Park views or imagine their family watching TV in the media room. The staging brings the apartment to life and the buyer can mentally move in, understanding what makes the apartment truly special. The photographs speak for themselves. In 2016, white is making trends year-round, not just between Memorial Day and Labor Day. Out are the days where it is a faux-pas to wear or utilize the crisp color in your interiors and accents past Labor Day. In interior design, all-white is a strong trend for 2016. White feels especially refreshing in the summer, but many are enjoying the crisp, minimal, feeling as many look to decrease clutter throughout their homes. 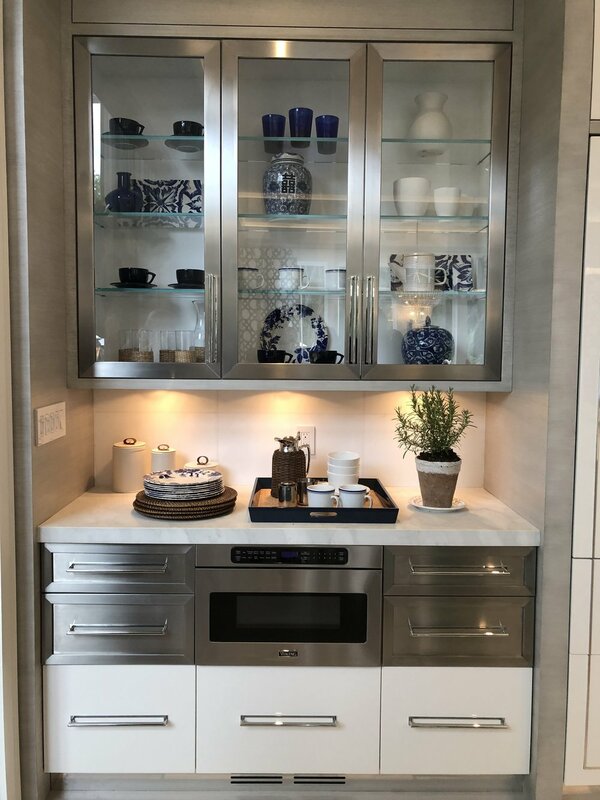 We are seeing the trend carried out throughout entire homes, with the newest luxury kitchens and baths featuring tonal white countertops and appliances, as well as luxurious marble and stone finishes in baths. Many are attracted to white because of its simplicity. It serves as a great background for interesting art, patterned interior accents and more. The color also evokes a sense of airiness that can make a space feel open and revitalized. This can be something to consider if you are thinking about listing your home. In luxury real estate, we are always seeing cutting-edge design trends, being the first set of eyes on designer showcase houses and by working closely with top staging agencies. From lush white rugs in living spaces to novel white accents, the refreshing white color palette is transforming spaces. Not only is white being utilized in interior designs, it is also trending in The Hamptons as an exterior color of choice. New homes are being constructed in classic hamptons style with wooden shingle sides done in clean white rather than tan tones. The Victoria Shtainer Team has curated a selection of "it" white design pieces to inspire you to add a little touch of this trend throughout your home. Looking for some white inspiration in luxury real estate? We have got you covered. We are loving the kitchen at our exclusive listing at 117 Bridies Path in Southampton. The brand new construction features a kitchen that is just waiting to be enjoyed with its pristine white calcutta marble counter tops and fresh custom designed white cabinets. Dinner party prep anyone? And, perhaps the most lust-worthy luxury real estate? This jaw-dropping bathroom at the exclusive 432 Park Avenue. The white backdrop is the perfect frame for the stunning views across Central Park and upper Manhattan. Get a look inside the luxurious 432 Park Avenue condominium here. And you thought white was boring? The 44th annual Decorator Show House is underway, showcasing work from top interior designers. The townhouse at the Carlton House has been completely transformed, and all for a good cause, namely the Kips Bay Boys & Girls Club. All proceeds from the events will go to the Kips Bay Boys & Girls Club which provides after school enrichment programs to more than 10,000 youth in the Bronx. In 1950, The New York Times announced "Astors to Build Hotel Apartment." The Astor Estates interests has ties to hotel properties in the city since 1848. They purchased 13 consecutive properties to make room for the new building which would become the Carlton House. The Carlton House got its name from the then to be demolished Ritz-Carlton, with the new building accommodating displaced tenants with penthouse and luxury hotel-service apartments. In 2010, Extell Development and Angelo, Gordon & Co purchased the property from the estate of the late Leona Helmsley. Now in 2016, the house is designated as part of the Upper East Side Historic, and is one of the largest newly constructed townhomes on the Upper East Side. It is 35 feet wide with approximately 10,000 square feet of living space with an additional 5,000 square feet of outdoor space. The Townhouse is currently on the market for $49,500,000. This townhouse presents a rare opportunity to experience amenity living rarely seen with other New York residences. Residents enjoy perks from being neighbors to Barneys New York such as food delivery from Fred's. Additionally, the townhouse resident has access to the full range of amenities offered by the Carlton House including 24-hour doorman, concierge, 65-foot indoor swimming pool, state-of-the-art fitness center, and private storage. Entry can be made directly from 61st street or through a private entrance within the Carlton House lobby. The expansive townhouse residence has become a showcase of work from renowned interior designers that have donated their time and skill to create the beautiful spaces. The interior features 5 floors of living space which have been transformed into sumptuous space from a Napoleon inspired sitting room with rich, dark tones to a Clive Christian kitchen complete with Lalique panels. The Show House will be running May 12 - June 9 2016. With all the technology it is no surprise that 'telecommuting' or working from home is on the rise as it can provide more work-life balance. Additionally, many run their business from their homes full time. A home office can be a valuable and productive space when done correctly, whether you are sitting down to pay the occasionally bill or running an empire from your home. Here are five things to consider when designing your home office. Location: Consider what space within your home you are thinking about transforming into a home office. Consider spaces with large windows and light. Your surroundings can highly impact your work ethic and attitude, so if you are going to be spending a large amount of time in your office it is important to ensure it is positioned correctly. Have you given thought to separating your work space from your spouse's? Our 166 Perry Street listing incorporates an office for him as well as a "woman cave" for her which can be a functional work space. Functionality: Having a balance between design and function is important when it comes to an office since the ultimate goal is to get work done. Of course we all want our spaces to be aesthetically pleasing, but keep functionality in mind when shopping for furniture, accessories, and decor. Organization: Make your space organized! It will eliminate clutter and allow for a more efficient work environment. Consider using your space wisely, as many home offices are on the smaller side. Shelves are a great way to use vertical space above a desk. There are some great desks that have a shelf system as part of the desk which is great for storage and organization. We love the amount of storage this Restoration Hardware desk offers. Color: Paint the wall a color by which you will love to be surrounded. Different colors have different effects on mood and the feelings they evoke. The psychology of color certainly affects each one differently, however, blue is generally said to be the most productive color. Equipment: Just like functionality vs. design, strike a balance between equipment and accessories/decor. It can be easy to spend on accessories to add to the space, however, it is important to ensure you have the proper equipment first so you can get work done. Invest in a good desk chair such as this one by Herman Miller. Spring is a great time to freshen up your space. You can freshen up your home or apartment without doing a complete overhaul of your decor. Sometimes, something as simple as the fragrance in the room can change the mood. Scent is one of the most powerful mood setters when it comes to decorating. This spring, consider updating your home fragrances with ones that uplifting and fresh like the season. Switch out spicy and woody fragrances more attuned with fall and winter for citrus and floral notes that are perfect for spring and summer. Below our some of our favorite scents for freshening up our spaces.